Don't miss this used 68' Fort Lauderdale Boat Show Cheoy Lee yacht! 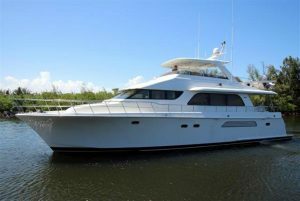 : Atlantic Yacht & Ship, Inc.
Another major price reduction on the beautiful used 68′ Fort Lauderdale Boat Show Cheoy Lee 2005 yacht that Mack Carroll has for sale in Florida! A timeless classic, this charming used 68′ Fort Lauderdale Boat Show Cheoy Lee yacht is sure to impress! Of course, this Cheoy Lee yacht is extremely comfortable. She features three staterooms, all with private bathroom, as well as crew quarters aft. Furthermore, with a main deck day head, this yacht boasts features found on much larger yachts. Additionally, this lovely used 68′ Fort Lauderdale Boat Show Cheoy Lee 2005 yacht is outfitted with desirable Caterpillar engines. These diesel engines have low hours and are “turn-key” and ready to perform. This yacht has updated electronics at the helms and is stabilized for a comfortable, dry ride. Similar to the larger yacht features, this beautiful used 68′ Fort Lauderdale Boat Show Cheoy Lee 2005 yacht has a water maker and underwater lights. This yacht has been designed and outfitted to feel like a mega-yacht. Her proud owner has maintained her with an open checkbook and it shows! Because of this superior maintenance this yacht shows like a much younger yacht. For more information on this used 68′ Fort Lauderdale Boat Show Cheoy Lee 2005 yacht for sale in Florida be sure to contact Mack Carroll today or come by at our display at the show!